Powdery mildew (Oidium neolycopersici) of tomato is emerging as an important disease of greenhouse crops. Unlike most powdery mildews that are host specific, this pathogen has a wide host range of at least 13 plant families including the Solanaceae, Alliaceae, and Cucurbitaceae. Symptoms appear on foliage as light-green to bright yellow lesions on the upper leaf surface. The spots enlarge and become necrotic. Lesions may exhibit concentric rings similar to early blight. 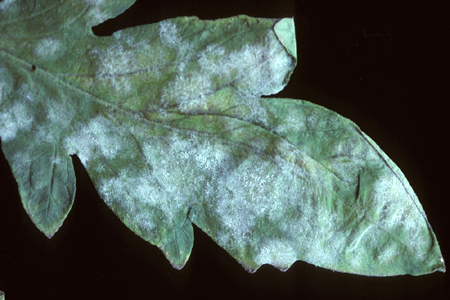 A light, powdery coating may be seen on leaf undersides. Under conditions favorable for disease development, a dense, white layewr of growth may develop on both leaf surfaces. Entire leaves wither and die, but remain attached to the stem. There are no symptoms on fruit or stems, but loss of foliage may results in sunscald. O. neolycopersici does not overwinter outdoors in northern climates. The pathogen overwinters in weed or crop hosts in the greenhouse. Conidia produced in southern areas are blown north by prevailing winds. This pathogen is favored by low light and cool temperatures. In contrast to other fungal plant pathogens, it does not require free water to germinate and cause diseases. Control weed hosts both inside and outside the greenhouse. Improve air circulation and light penetrtion by plant spacing, proper irrigation practices, and the use of fans in the greenhouse. Pruning and staking improve ventilation in both the greenhouse and field. DeRuiter’s Seeds has recently released the cultivar Grace which has resistance to powdery mildew. For Current information on disease recommendations in specific crops including information on chemical control & pesticide management, please visit the New England Vegetable Management Guide website.